I was blown away by the review I received from Jessica of Gee Gee and Me. Reading this has made the whole experience worthwhile! 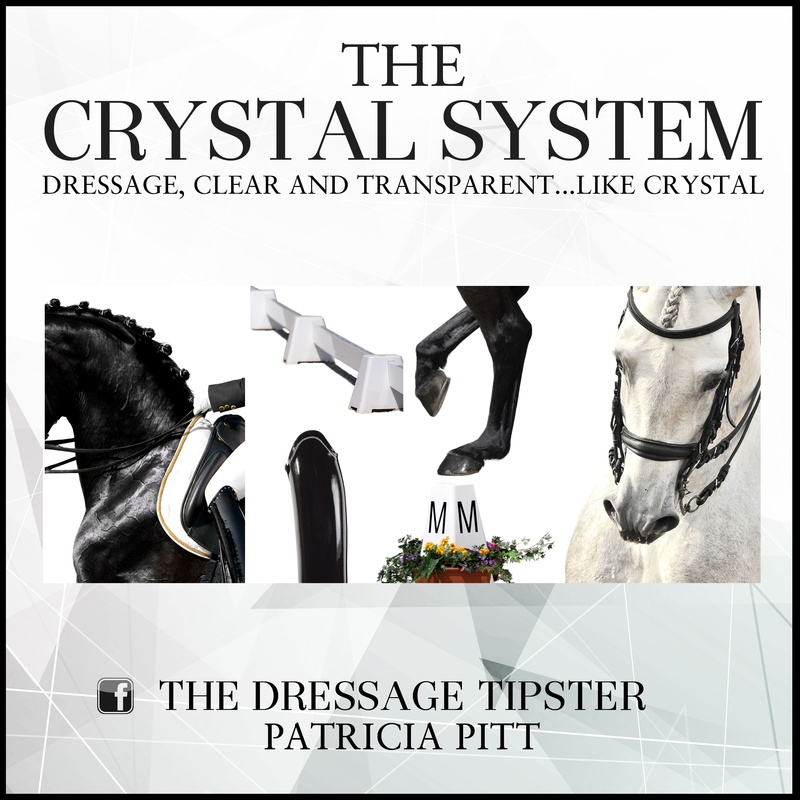 The Crystal System by Patricia Pitt, more famously known and bowed down to as; The Dressage Tipster is the writer of the thought provoking blog I have followed for many years, so when the opportunity arose to read and review her newly released book, to say I was excited would be an understatement! Those of you who follow Gee Gee and Me on Facebook will know how much I loved every page of the engaging read, I never picked it up without my notebook and pen by my side and it has more post-it’s sticking out, left, right and centre, than my favourite cook-book! My nickname at the yard is “sponge” because I love to learn and have a genuine thirst for knowledge, as soon as The Crystal System arrived I declared “I can’t wait to get schooling tonight”…then I read page 7 and halted. The Crystal System asks me (the reader) to read the book cover to cover before beginning my crystal clear journey…and this is what you will all embark upon when you read The Crystal System. 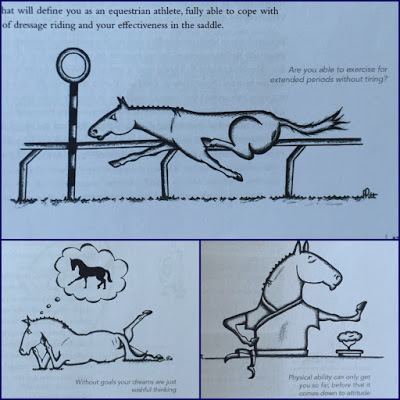 Yes, it’s a book but my goodness it’s personal, I am competing, training and learning more than ever before in my equestrian career but have never undertaken such self evaluation until now. I’d almost call it, self help! and based on a cartoon version of Mark’s (Patricia’s partners) Lusitano mare. Recently I had a lesson with someone I have trained with for many years, the trainer is an acquired taste but one that has suited us in the past, due to finances I hadn’t been to a clinic in some months. The trainer paused the lesson after my first walk around the arena and changed everything about our picture, the “new and improved” position made a muscle in my back pull (as a pilates geek I was overly aware of this, therefore Oscar will have known my discomfort), I felt like a mannequin, unable to use my legs I asked for my whip, a-ha, couldn’t use my whip, doing so affected my hands, then guess what, they were wrong too. I got off in despair, the trainers comment ” that’s called riding”, well it sure didn’t feel like freedom, one of the main reasons I commit my entire life to my horse for!? This session has played on my mind ever since because I consider myself a competent and knowledgeable rider, I am not afraid to ask why, I like to understand processes and ride to the best of my ability, taking notes and doing my homework in-between lessons, I felt like Patricia related to me in this first chapter and agreed, various methods and theories are good, but which is The One the follow? It is so very easy to get lost. Chapter two moved onto our personal drive, page 15 has a post-it with a big hand drawn love heart, pointing to this sentence; I was surprised to learn that the vast majority of successful people feel like imposters from time to time; it’s actually a positive sign. Oscar and I joined British Dressage in December as associates, warming up in my tweed hacking jacket I wear out hunting made me feel like the poor relation, the twice we have competed we’ve scored 60%+ and walked away with a third and second placing in very competitive classes…both times I have driven home wondering did I deserve this? I find self praise challenging and give myself a hard time for anything I do that in my opinion is less than perfect! Chapter two certainly helped me as it made these “faking it” feelings acceptable and not to dwell on them. Chapter three was to dream…chapter two made dreaming a little easier, yes we did score 60%+ in our first two débuts!! 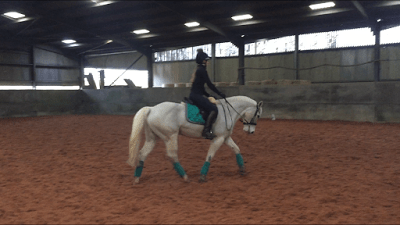 And The Crystal System got my bottom into gear to read the British Dressage rule book 2016 and learn where Oscar and I could fit in that world. Had the chapter been titled Goal Setting, I’d have probably groaned and flicked past…I do enough of that in my 9-5, this is my hobby, I do it for fun, yes? The Crystal System is motivationally written throughout, avoiding any of these feelings. This theme continues throughout the twelve incredible chapters! I work in a professional environment were appraisals are regularly conducted and SMART goals are set, yet my personal life is such a busy blur that I never made the time to sit down and assess my aspirations against reality, never mind put a crystal clear plan in place – maybe I was what I’d call in the office, a busy fool?! Personal insight; after discussing this picture with my coach, aka The Crystal System book I positively want to address where my weight is, how this is affecting Oscar’s shoulders…why my shoulders and eyes aren’t looking up, up and away? Why have my arms drifted from my torso? Not to mention how much more powerful this image would be with increased forwardness? A month ago I’d have probably just said, I don’t like the picture. Today I have a crystal clear plan of how Oscar and I are going to improve it…exciting times! A huge thank you to Andrea of Andrea Sexton PR for allowing us the opportunity to review The Crystal System.